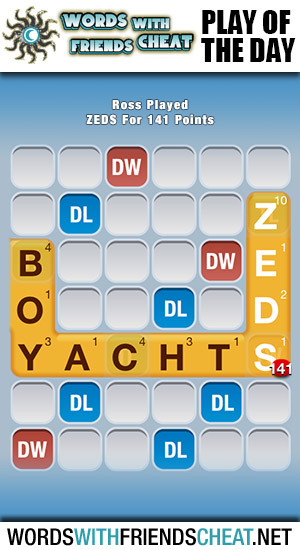 Today’s Words With Friends – Play Of The Day is ZEDS (141pts) and was submitted by Words With Friends Cheat user Ross. A powerful and well thought out play by Ross. Laying a “z” on a triple letter and then connecting two separate words using the triple word tile was brilliant. This play probably couldn’t have gone any better. 1. the letter Z or z.